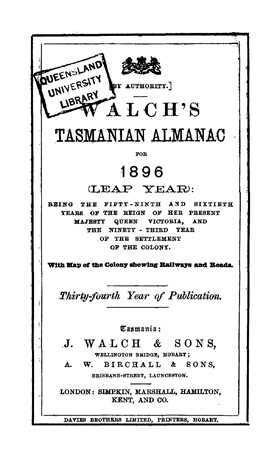 Walch's Tasmanian Almanac was produced in Hobart by J. Walch and Sons from 1863 until 1980. It had a variety of titles in the time that it was published but was commonly known as Walch's Almanac. Also known as the "Red Book", it contained detailed information about Tasmania for the year it was published, with information about all regions and towns of the state. Included in this collection are almanacs covering 1891 to 1915. Almanacs are a useful genealogy resource for 'adding flesh to the bones' - in other words, finding out more about your ancestors and the society in which they lived, their occupation, the town they lived in, the businesses in the district and the cost of items at that era. It's essential for anyone searching their family history and building a family tree.